In my four years as an editor and co-founder of the cutting-edge web magazine for transformational culture Reality Sandwich, I have witnessed a rare voice gain a large following due to his staggeringly visionary ideas and heart-felt essays. 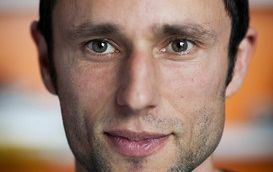 Charles Eisenstein is a popular teacher, speaker and author of the recent Evolver Editions release "Sacred Economics: Money, Gift, and Society in the Age of Transition." Spiritual activist Andrew Harvey has called Eisenstein's book "an indispensable must-read for all those who believe our economic system is terminally sick and in need of radical, sacred rehaul." While political pundits, financial analysts and Occupiers fumble on how to transcend the intensifying global financial crisis, Eisenstein is trailblazing bold new ideas and possibilities for how we conduct monetary exchange. It is no surprise that "Ode magazine" featured him in their "25 Intelligent Optimists" issue with author David Korten, describing Eisenstein as "one of the up-and-coming great minds of our time." In this interview, I talk with this rising "great mind" about the ritualistic origins of money, the spirit of the gift, negative interest banking, the future of the Occupy Movement, and the alchemical art of making economics sacred. Let's start off with the question most people are probably asking. Can economics really be sacred or is money inherently profane? After all, there was a reason Jesus kicked the moneychangers out of the temple. Obviously, if anything is sacred today, it certainly isn't money. Ask yourself, is money a positive or negative influence in politics? In preserving the rainforests? In protecting the indigenous? Is it an ally or an obstacle in following your own heart in making important life choices? Does money bring out the best, or the worst, in human beings? Generally speaking, the answers to these questions suggest that money is something malignant. We almost take that for granted -- that moral behavior or even socially beneficial behavior isn't motivated by money. But why should that be the case? Money, after all, is a social agreement, or actually a system of agreements that essentially express what that society holds valuable. It rewards certain activities but not others. So the premise of my book is that, given that money is a social agreement, it should be within our power to enact different systems of money that embody different agreements about value. The time for this is upon us, because humanity is indeed in a time of transition. What was once sacred to us (meaning civilization) is becoming no longer sacred. For example, just a couple generations ago, we revered growth: the expansion of the human realm, the conquest of nature, etc. Today our values are changing, and we want to protect and heal nature. But money is still rooted in the old values. So, what I mean by "sacred economics" is the realigning of money with those things that are becoming sacred to us today, those things that we deeply value. In your research, did you find societies that employed a sacred approach to monetary exchange? If so, what can we learn from them and how can we apply those lessons to today's complex banking system? To find anything resembling sacred money exchange, you have to go back thousands of years to the days when money was used for ceremonial purposes and to arrange human relationships. David Graeber gives a marvelous account of this in his book, "Debt: The First 5,000 Years." He describes how the first money wasn't used to buy and sell goods, but rather to negotiate marriages, blood disputes, friendship, etc. That is not to say that a trace of money's ritualistic origins cannot be seen today. From the symbols on a dollar bill, to the deified presidents on coins, to the mini-ritual of signing a check or contract (putting your sacred mark on a piece of paper), we have vestigial reminders that something significant is happening in our relations of giving and receiving. But really, the lessons I draw from in examining today's banking system have less to do with early money systems, and more to do with a different economic model that was prevalent until recently: the gift economy. I envision a money system based on the principles of the gift. Now that may seem completely unrealistic, so let me explain. First, I am not talking about eliminating money, though I do believe we can reduce its role in our lives. One principle of gift societies is that wealth is not a matter of hoarding. If you are a primitive farmer and you have a huge harvest one year, then you won't benefit by keeping it all in your granary, where rats and mold will get to it. You would rather give it out into the community, where it will generate gratitude. Then when you have a bad year, people will want to take care of you too. The same for hunter-gatherer societies: if you killed some big game, you would invite everyone to the feast. In my book I quote a tribesman from the Amazon who was asked why he didn't dry and store meat instead. "I store meat in the belly of my brother," he said. Meaning, everyone will invite him to their feasts too, and give him other gifts. How can we possibly apply that to the financial system? One way is to change the way money is created and circulated. Today the creation and circulation of money is based on interest-bearing debt. In an interest-based system, the rich get richer and the poor get poorer. You can redistribute wealth through taxation, but that is the underlying dynamic: wealth comes from having, not sharing. We could quite easily reverse that dynamic, however. One proposal I discuss is negative interest in the form of a liquidity charge on central bank deposits. I'll spare you the details for now, but basically what it means is that if you keep money that you don't need, its value will decline over time. You'll be better off letting someone else use it -- even at zero interest. Let me put this in the context of what is happening in Europe right now. Debt is rising faster than the ability to pay it. The solution has been to lend the debtor even more money in exchange for a promise to turn over more of the debtor's assets and future income to the creditor. That is called "austerity," and it only works if the debtor starts making more income in the future (because now he's even more in debt). Systemically, the system only works in the presence of economic growth, and that growth has to continue forever. That's a problem on a finite planet, isn't it? But we are trapped in that logic -- all the politicians, right, left and center, are talking about how to stimulate growth. That's because without growth, the debts cannot be paid. First, the concentration of wealth intensifies, and then the system breaks down in a wave of defaults. A negative-interest system works differently. No longer is it necessary for the economy to grow forever just to keep pace with the exponential growth of debt. The money system still works in a steady-state or degrowth economy. And I think it accords with spiritual truth too: for example, the ecological principle that all things return to their source, and the spiritual principle of impermanence. Money should decay like everything else in the universe. Today we attach ourselves to the seeming permanence of money, associating it with security and acting as if it could forestall death itself. We know we can't take it with us, but we sure act as if we could. That is because, as it stands, money furthers the illusion of impermanence. The bondholders want their investments to grow forever. But we are so entrenched in the current economic system. Do you really see practical steps to transform money from the profane to the sacred? Yes, the steps are very practical, and some of them are already being discussed on the fringes of policy circles. Green taxes, for example, are already in place in some European countries. Imagine what the effect would be here if plastic bottles and packaging had 25-cent surcharge -- all of a sudden there would be a huge incentive to set up a refilling-based food distribution system. Imagine if we replaced income taxes with taxes on resource extraction, aquifer depletion and so on. Then products made from recycled materials would enjoy an economic advantage. These are very practical ways to align money with our ecological values. As for negative interest, it is so practical as to be nearly unavoidable. In fact, some countries (like Denmark) have already "gone negative" by a fraction of a percent. I won't go into the details now, but let's just say that the big opportunity will come with the next debt crisis. And I think that we need to have a people's movement to create pressure from underneath to change the debt system. Today, more and more people face a lifetime of debt servitude. A debtor's revolt -- as has happened repeatedly throughout history -- is brewing. We don't want to be thralls to distant, faceless institutions, working frantically at jobs that keep us small, all to make money to send into the bottomless pit of debt service. As the hardship of it intensifies, more and more people will begin to go on strike -- a debt strike. You can see that this isn't only an economic movement, it is a spiritual movement. It is a matter of how we direct our precious life energy. Could you give us a better understanding of "the spirit of the gift" that you've spoken about in your book? What that is and how it works? The foundational idea is that we live in a gift universe. We didn't earn being born, being fed as babies, having an earth to live on, air to breathe, water to drink. All came as a gift. Ancient cultures often recognized this explicitly; theirs was a gift cosmology that was echoed in their economic systems. Even today, we retain a knowing that life itself is a gift and that, therefore, our purpose is to give in turn. If you are ever in a job where your gifts are not going toward something meaningful, at some point you'll probably think, "I wasn't put here on earth to do this!" You'll be dissatisfied no matter how much money you are making. So, living in the spirit of the gift means to accept this and live from it. It is to see life as a gift, and to see our purpose as givers. My book also describes how to translate this into modern economic institutions. Gift economy worked fine for hunter-gatherer tribes, but how would it work in a mass society? It isn't about abolishing money, but rather imbuing money with the spirit of the gift. For example, in gift cultures wealth, security and status do not come from hoarding, but from generosity. You can also see ecology as a kind of gift circle, in which the waste of one species is the food of the next. We need to incorporate our economy into the circle of ecology as well. The Occupy Movement seemed to be headed toward this, but the momentum for it may be floundering at the moment. Do you see Occupy having resurgence, or will something else take its place and move "economic activism" in a new direction? Occupy was a new experience for many of the people involved, and I think it is quite normal for there to be a time to digest it. The "floundering" you speak of, which includes a lot of debates, questions, controversies, is part of the process of hashing it all out. Tactics like occupying public space have their moment, and for the movement to be named after a tactic may be constraining. So yes, something will take its place, but it will also be a continuation of the same movement. It will include many of the same people, raise the same issues and operate by many of the same principles. It will also be far more powerful, because our economic crisis will surely intensify. The resulting hardship, indignation and desperation will generate a much broader popular movement. Jonathan Talat Phillips is the author of 'The Electric Jesus: The Healing Journey of a Contemporary Gnostic' and co-founder of The Evolver Network and Reality Sandwich.